WASHINGTON - NASA briefedsenior White House officials Wednesday on its plan to spend $100 billion andthe next 12 years building the spacecraft and rockets it needs to put humansback on the Moon by 2018. The U.S. space agency nowexpects to roll out its lunar exploration plan to key Congressional committeeson Friday and to the broader public through a news conference on Monday,Washington sources tell SPACE.com. U.S. President George W.Bush calledin January 2004 for the United States to return to the Moon by 2020 as thefirst major step in a broader space exploration vision aimed at extending thehuman presence throughout the solar system. NASA has been workingintensely since April on an exploration plan that entails building an 18-foot (5.5-meter)blunt body crew capsule and launchers built from major space shuttle componentsincluding the main engines, solid rocket boosters and massive external fueltanks. That plan, called theExploration Systems Architecture Study, was presented by NASA AdministratorMike Griffin, his space operations chief Bill Gerstenmaier and several othersenior agency officials Wednesday afternoon to senior White House policyofficials, including an advisor to U.S. Vice President Richard Cheney and thepresident's Deputy National Security Advisor J.D. Crouch. NASA's plan, according tobriefing charts obtained by SPACE.com, envisions beginning a sustainedlunar exploration campaign in 2018 by landing four astronauts on the Moon for aseven-day stay. The expedition would begin,these charts show, by launching the lunar lander and Earth departure stage(essentially a giant propulsion module) on a heavy-lift launch vehicle thatwould be lifted into orbit by five space shuttle main engines and a pair offive-segment shuttle solid rocket boosters. Once the Earth departurestage and lunar lander are safely in orbit, NASA would launch the CrewExploration Vehicle capsule atop a new launcher built from a four-segmentshuttle solid rocket booster and an upper stage powered by a single spaceshuttle main engine. The CEV would then dockwith the lunar lander and Earth departure stage and begin its several dayjourney to the Moon. NASA's plan envisions being able to land four-person human crews anywhere on the Moon's surface and to eventually use the system to transport crew members to and from a lunar outpost that it would consider building on the lunar south pole, according to the charts, because of the regions elevated quantities of hydrogen and possibly water ice. One of NASA's reasons forgoing back to the Moon is to demonstrate that astronauts can essentially "liveoff the land" by using lunar resources to produce potable water, fuel and othervaluable commodities. Such capabilities are considered extremely important tohuman expeditions to Mars which, because of the distances involved, would bemuch longer missions entailing a minimum of 500 days spent on the planet'ssurface. NASA's Crew ExplorationVehicle is expected to cost $5.5 billion to develop, according to governmentand industry sources, and the Crew Launch Vehicle another $4.5 billion. Theheavy-lift launcher, which would be capable of lofting 125 metric tons ofpayload, is expected to cost more than $5 billion but less than $10 billion todevelop, according to these sources. NASA's plan also calls forusing the Crew Exploration Vehicle, equipped with as many as six seats, totransport astronauts to and from the international space station. An unmannedversion of the Crew Exploration Vehicle could be used to deliver a limitedamount of cargo to the space station. NASA would like to fieldthe Crew Exploration Vehicle by 2011, or within a year of when it plans to flythe space shuttle for the last time. 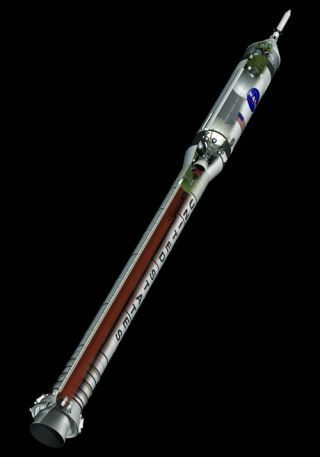 Development of the heavy lift launcher,lunar lander and Earth departure stage would begin in 2011. By that time,according to NASA's charts, the space agency would expect to be spending $7billion a year on its exploration efforts, a figure projected to grow to morethan $15 billion a year by 2018, that date NASA has targeted for its firsthuman lunar landing since Apollo 17 in 1972.